Nina Harding has designed and conducted hundreds of training workshops in Australia and Asia Pac region. She has conducted postgraduate training courses at numerous universities including the University of Sydney, UTS, La Trobe University and Hong Kong University. Nina has conducted training for ATSIC, NSW Premier’s Department, Optus, The Insurance and Savings Ombudsman NZ, The Energy and Water Ombudsman NSW, The Financial Ombudsman Service, Aboriginal Land Councils, KPMG, US Aid, CommSec, The National Australia Bank and United International Pictures. We will happily design a workshop to meet the unique needs of your group. 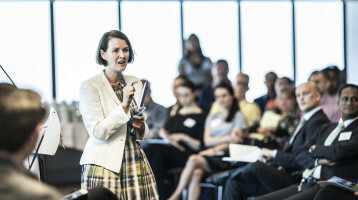 Nina Harding is a popular speaker at conferences, including: keynote speaker at the Insurance and Savings Ombudsman’s Conference in NZ; Financial Industry Complaints Service annual conference; Energy and Water Ombudsman Victoria, annual conference. Nina is a Lead Trainer for LEADR. LEADR is the preeminent association for dispute resolvers in Australia. Nina is currently a casual lecturer at UTS. Please see the Our Expertise page to read more about Nina’s professional qualifications. We have trained hundreds of lawyers and business people in negotiation skills. Click hereto learn more about our fun/interactive and effective negotiation programs. An exciting and popular program for anyone dealing with complaints. Nina has trained hundreds of people from the financial, telecommunications and utilities industries in effective complaint handling. Save time, money and stress by managing complaints more effectively. Click here to learn more. Nina Harding has been teaching mediation training workshops for over a decade. She has taught judges, barristers, counsellors, teachers, business people, university students, union officials and many others how to resolve disputes. To find out about our mediation training please click here. Many Australian companies are learning how to communicate and engage with their local communities. Companies that are able to communicate openly with their local communities have an opportunity to understand their concerns and avoid conflict. To find out more about our work with Community Engagement please click here. To find out more about the training we conduct in Community Engagement please click here.